Smoked lobster suimai dumplings, hot cheese & fried chicken filled Taiwanese wheelcakes, Spanish-Indian tapas feat. 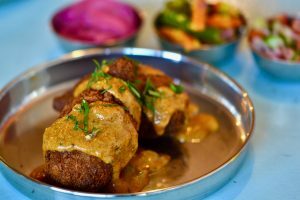 Punjabi pintxos, pickled fig onion bhajis, lamb jalfrezi sliders and braised Iberico pork cheek with chana masala and vegan vindaloo curry-smothered deep fried jackfruit wings. 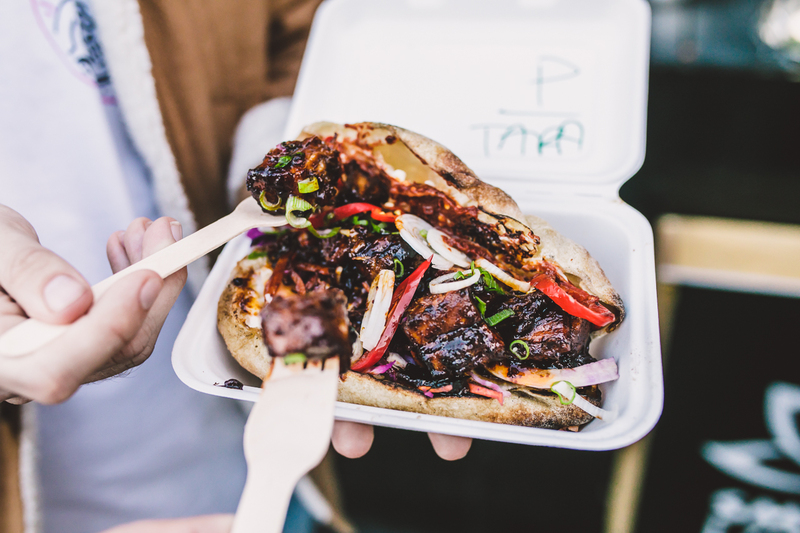 We have FOUR MEGA street food KERBlaborations coming to #KERBSHOUSEPARTY this Friday. (TICKETS HERE). Before you eat them, meet the makers behind the dishes. 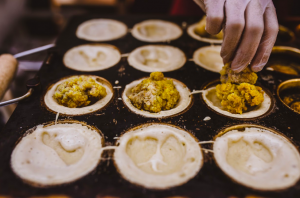 Menu: Wheelcake Island’s usual hot custard and red bean paste fillings make way for Asian spiced da ja fried chicken bites / beef gochujang bone marrow – both clamped in a puddle of hot cheese sauce. Biggest food inspiration? My family owned a Chinese restaurant (we lived above the restaurant) when i was growing up in Sydney, Australia. I was fortunate enough to be served the best Chinese food on a daily basis. In my opinion nothing compares! Why you’re KERBlaborating with Wheelcake Island? I’ve been in love with Wheelcake Island (JC, CJ and Felix) since day one. I found their wheelcakes warm and nostalgic, so it was natural that I wanted to collaborate with them! I’m extremely excited for everyone to try our dish. Your story. 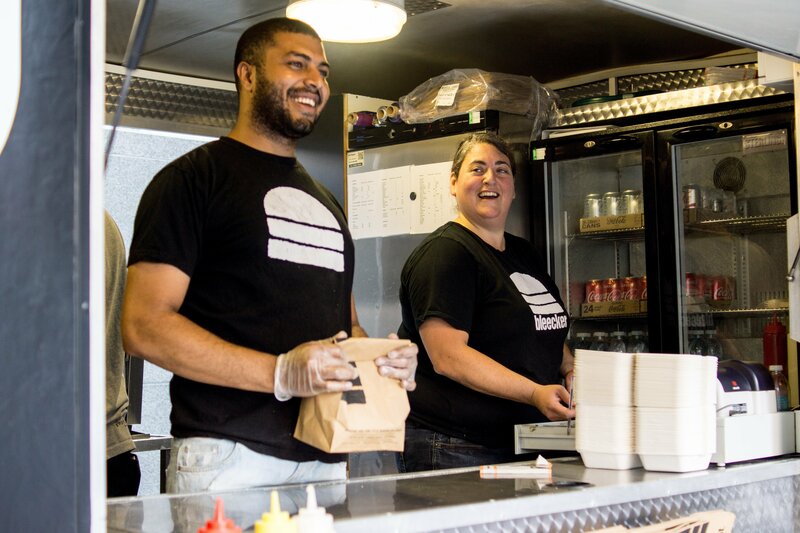 When did you make take the plunge into street food? ‘Will travel for food’ is my motto. I have always loved visiting street food vendors in other countries. 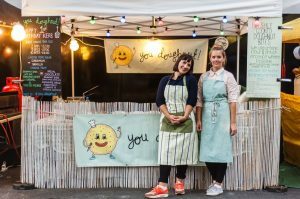 I quit my full-time job in footwear design to plunge into the vibrant world of street-food. Biggest food inspiration? Mainly from Taiwanese street food. Our local customers feed us lots of great ideas too. Why you’re KERBlaborating with da ja? 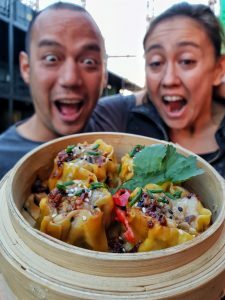 We are both Asian (and Taiwanese) inspired street food/snack and thought it would be really fun for a sweet trader to do a KERBlaborating with a savoury trader. Your story. 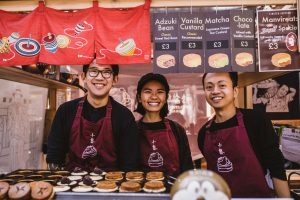 Why did you take the street food plunge? We started to make these Taiwanese wheelcakes from a very simple intention. At that time it was impossible to find wheelcakes in the UK and we really missed it. Backyard Filipino BBQ meets Rosie’s (back-garden) Asian smoked BBQ. Menu: Smoked lobster and pork steamed sui mai dumplings with sesame dust and chilli oil vinaigrette pearls – (you get to take the steamer home with you too). Your story. Why did you take the street food plunge? I grew up learning how to BBQ with my dad in my garden shed and learnt a lot from family cooking growing up. In 2017 I got engaged and was so shocked at the price to hire wedding caterers that I convinced my husband to let me spend £8k on catering equipment and I catered our wedding myself! Smokin’ Lotus was born. And meet the legends below. Biggest food inspiration? San Sebastian is the place that has inspired how and what I cook. Why you’re KERBlaborating with Baba G? Why not! I’m lucky enough to call Baba G a friend so I’m really looking forward to cooking (and perhaps having a couple of beers) together! Your story. 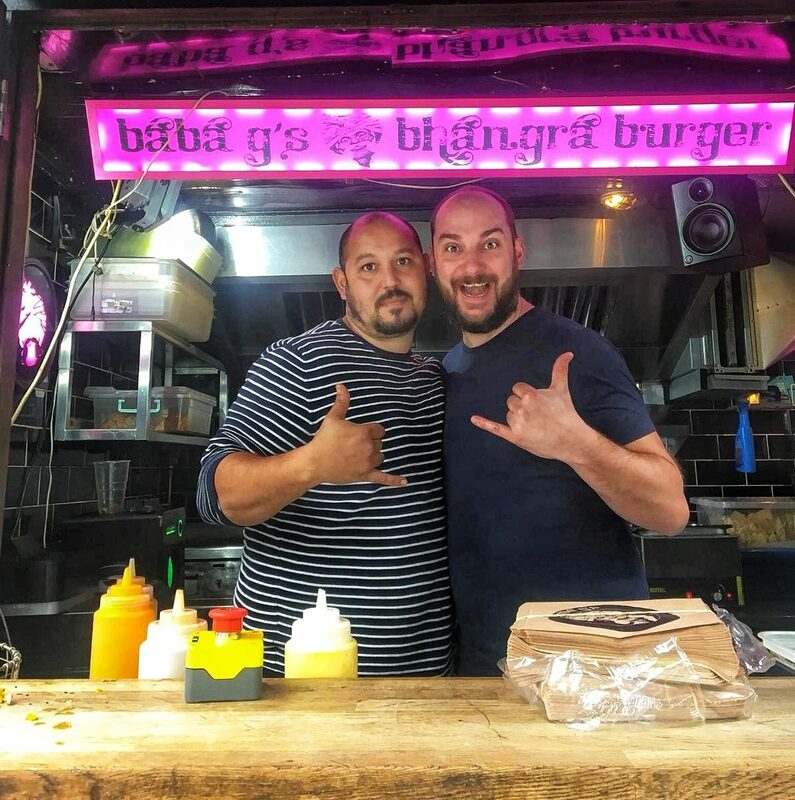 Why did you take the street food plunge? 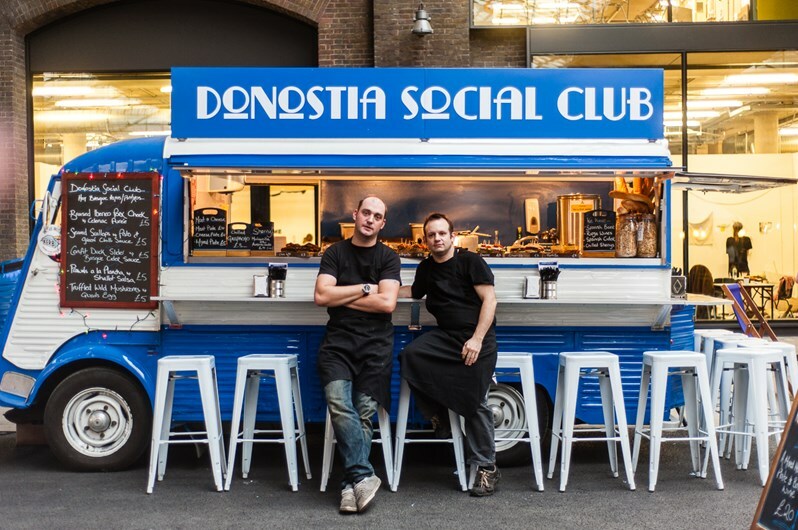 I’ve been a chef for 27 years and I thought it was time to try and do something for myself so about 7 years ago and taking inspiration from the food of San Sebastian – I brought a Citroen H van, painted it Basque Blue and started finding pitches. The rest as they say is history! Biggest food inspiration? My mum. Why you’re KERBlaborating with Donostia? 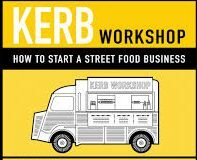 I can’t say no to KERB… You’ll never work in street food again!!!! Your story. Why did you take the street food plunge? Long story but basically didn’t want to work for anybody else. 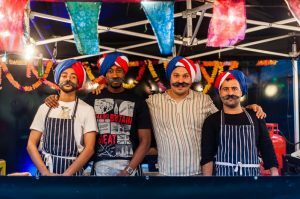 I started Baba G’s with my wife Liz back in 2012 and we used to trade at lots of festivals. 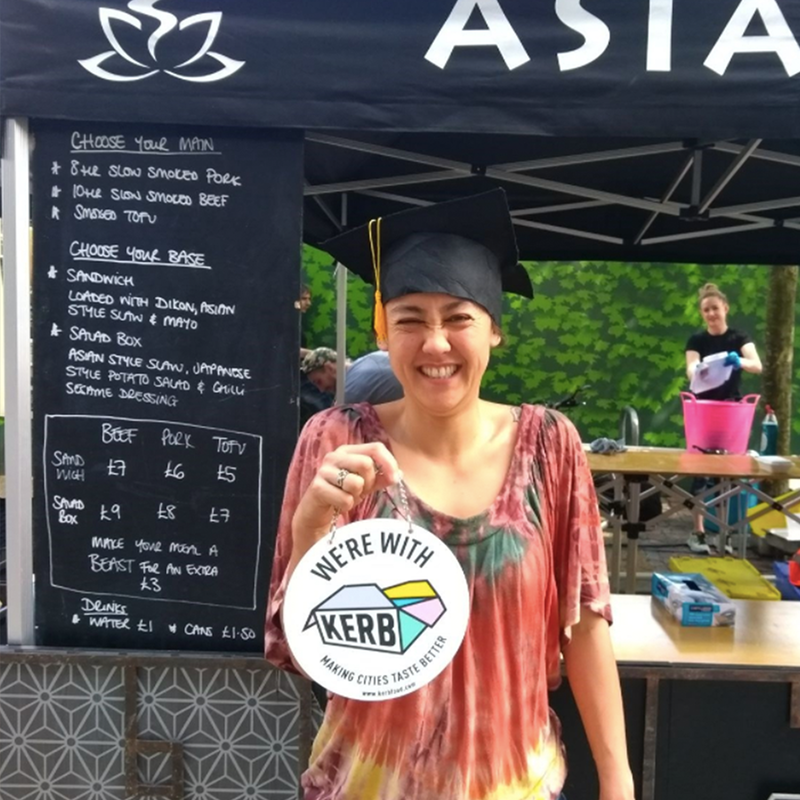 We met KERB Founder, Petra, trading from her Choc Star van. 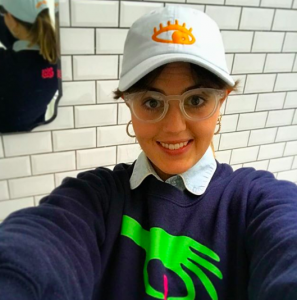 Ex-Silicon valley entrepreneur, Grace Regan of SpiceBox and ex-tech wizard Biff (2017 inKERBator graduate) are joining brains at the party. The main event: vindaloo dunked deep fried jackfruit wings on sugar cane spear (above). Plus: wings with masala and vegan curry soaked spicy chips. Biggest food inspiration? New York. I don’t think anyone does the indulgent stuff better. When I first went, about 11 years ago, I think the UK was still very much in the grips of ‘good’ food being fine dining, and it was so liberating to be in a place where it was simply about the pleasure of eating. 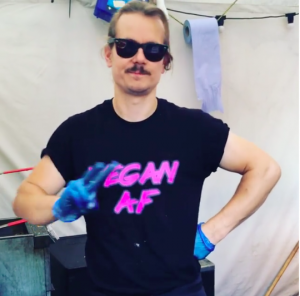 They were years ahead of us when it came to creative vegan food, and NY is also where I first had my mind first blown by street food at an all-night taco van somewhere in the Lower East Side (I may have had a few beers at the time, but I still maintain it was damn good). 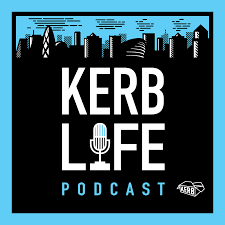 Why you’re KERBlaborating with SpiceBox? We bloody love curry, and we’ve always wanted do something with a hot curry sauce, so when Grace got in touch, it was a no-brainer. Your story. Why did you take the street food plunge? I’ve always loved to cook but the momentum to turn it into a living only happened when I was transitioning to a 100% vegan diet. I was so disappointed with vegan burgers and after being introduced to jackfruit in Indonesia the summer before I had fell in love with its meaty texture and had this crazy idea to deep fry it. We spent a few months developing that idea before taking it to KERB to try out. 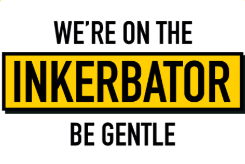 KERB invited us to join their June ’17 inKERBator. Biggest food inspiration? For me, travelling is my number one food inspo. I try to go to India every year and always come back full of ideas. In terms of people in food, I really admire and look up to Ruth Rogers. Not only is she an amazing (self-taught) chef but also a very wise intelligent woman who has gone through a lot of struggles but remained grounded and graceful. If you haven’t listened to her Desert Island discs you should! Why you’re KERBlaborating with Biff? 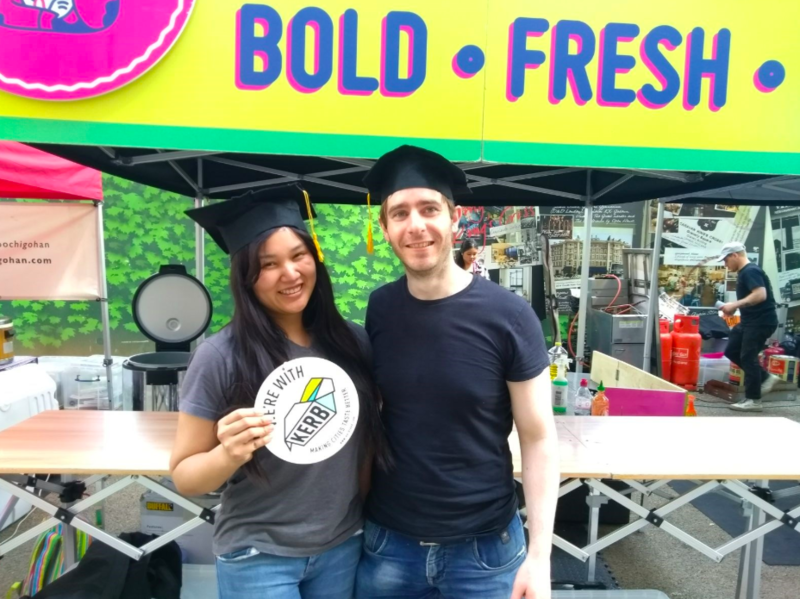 Biff is a true vegan street food innovator and, even though we both do vegan street food, our products are at opposite ends of the spectrum. But when you put opposites together, magic happens! Your story. 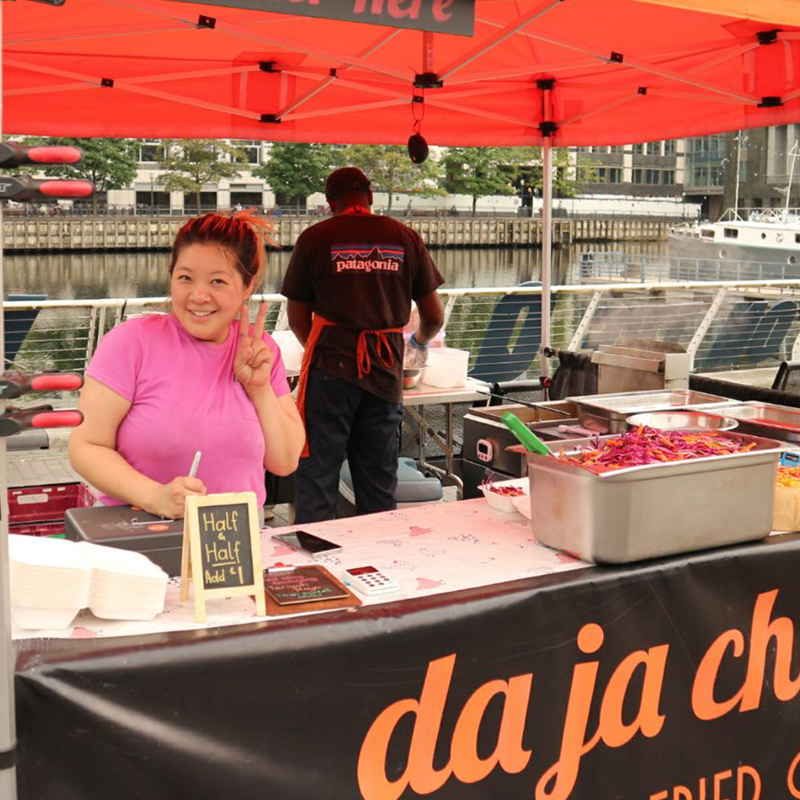 Why did you take the street food plunge? I got into street food by accident! 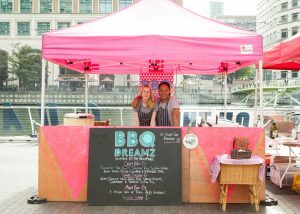 My plan was always to go straight in to opening a site but thank god I found the street food life first! I decided to launch a food business when I was living in California. I had recently turned vegan and was amazed by how easy it was to eat a plant-based diet in San Francisco. I wished London was just as accommodating so I decided to do something about it! 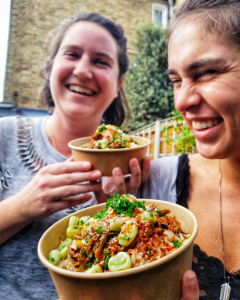 Swapping their usual chilli butter Portuguese steak pregos for Portuguese ‘de Pato’ duck and rice; Growler girls, Charlie and Lara, will be storming the canopy this Friday with their latest street food venture, de Pato. 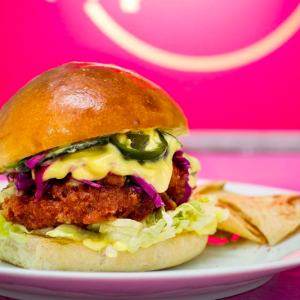 #KERBSHOUSEPARTY’s will be the first place you’ll get to try it. Menu: ‘Quack Attack’ duck, rice, port gravy, broad beans, crispy chorizo bowls. And we’ve heard rumours they’ll be serving them with a topping of fried chicken wings. 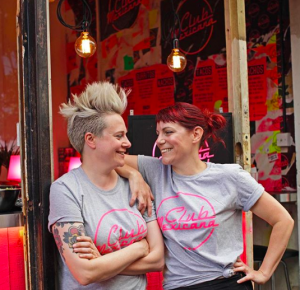 Vegan street food pioneer, Meriel at Club Mexicana, has gone from strength to strength since launching back in 2013. 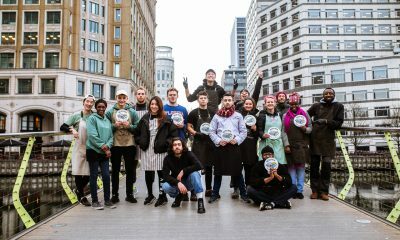 She’s now smashing it with a permanent residency at The Spread Eagle Pub in Homerton and was named No.3 in Timeout’s ‘Top 50 Londoners Who Make the City Awesome‘. Yes, you’ve probably tried her tofish tacos and jackfruit burritos but at KERB’s House Party she’ll be busting out burgers featuring two specials never tasted before. Menu: Mexican Fried Chick’n with annatto glaze, mustard mayo, pickled cabbage, dill, jalapeno; chorizo and potato with chipotle mayo, pink onion, salsa verde & pickled chilli; and Jackfruit Barbacoa (GFO) beef style jackfruit in salsa roja with salsa verde & sour cream. On the side: Deep-fried Cheeze with sour cream and hot sauce, and triple fried potatoes with chipotle mayo. The man behind one of our Top 10 trader dishes of all time, Simon Luard! 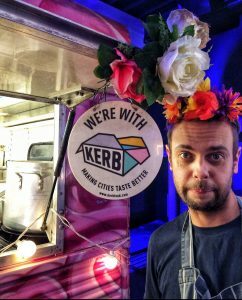 Get one of his legendary tacos at #KERBSHOUSEPARTY this Friday night or if you can’t wait until then, he’s shared the recipe with us so you can make on at home first. 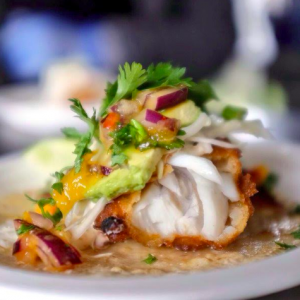 Menu: Taqueria Tacos – choose from beer battered haddock, chipotle cream, mango salsa, sesame cabbage, or blackened chicken thighs, avocado salsa, radishes; black beans, butternut squash, queso fresca, scotch bonnet salsa, pepitas; or carnitas, salsa verde and pink onions. 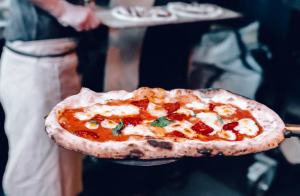 Wood-fired British pizza out the side of a Land Rover – where else? Menu: Hawaiian special with smoked ham and charred pineapple; pepperoni, portobello mushroom & truffle and a vegan mozzarella roast pepper sourdough pizzas. SEE YOU AT THE PARTY ?